You've reached your 40th birthday, and you know what that means: it's time for your first mammogram. Or you've discovered a lump in your breast; you're just 37 years old, but the doctor says you'd best have a mammogram. Are you scared? Don't be. You may have heard horror stories about "the big squeeze:" the pain of compressing your breasts way beyond the point they want to be compressed. Or you're shy, not used to standing around half-naked while a fully clothed stranger manipulates your breasts. Or you're just uneasy at this new procedure in your health-care regimen. Whatever your reluctance to have that first mammogram, I'm here to tell you: it's not that bad. Really. I recently went for what must have been close to my 20th mammogram. No, I'm not THAT old. But since I started having mammograms at age 40 and had breast cancer at age 47, I've had more than the usual number of mammograms. 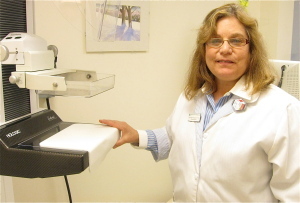 So I thought I'd bring my digital camera along to my annual mammogram, do an up close and personal VERY personal! photo story of what it's like. Mammogram: The Big Squeeze Deconstructed. 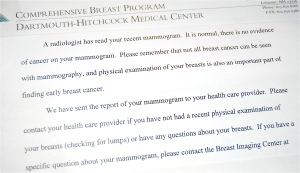 If this is a regular preventive-care mammogram, the process usually starts with a letter. You'll be given an appointment, and told where to go. 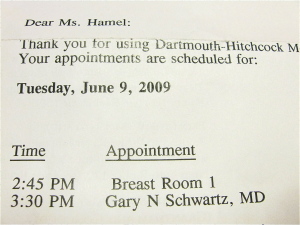 Since I see my oncologist after every mammogram, I was scheduled for an appointment with him, too. You won't have to see a doctor if you're a woman who's simply having a yearly mammogram. Here we are, in radiology. 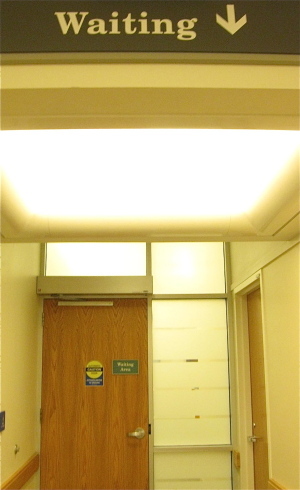 As you can see, this is where folks go to get regular X-rays and DEXA scans (to check for bone health), as well as mammograms. Check in, and head for the waiting room. 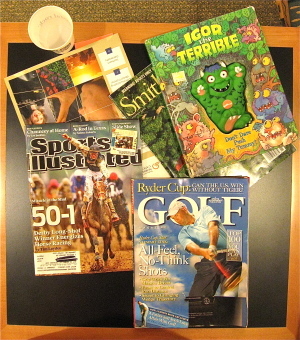 Check out the magazines. Looks like they're all set for kids, golfers, and sports fans. Not bad, but I suggest bringing your own reading material. ...while you change into this stunning outfit. You'll get naked from the waist up, then don a johnny that opens in the front, with a robe over it. Yes, you'll feel funny walking around in this "sleepwear," but don't worry; you're not going far. 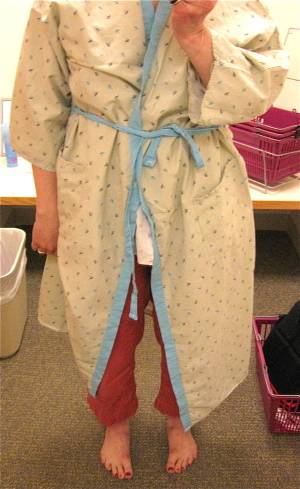 Practically speaking, it's best to dress in something simple on mammogram day. Never mind the layered look; a bra and shirt are easiest. OK, take your seat in the mammogram waiting room. Don't worry; only other women and no men will see you in here. 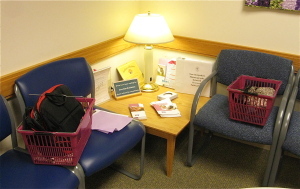 Oh, and notice the basket; you'll be carrying it with you to the actual mammogram room. You can see I stuck my backpack in the bucket, and it barely fit; best not to arrive for your mammogram with a huge purse, or lots to lug around. 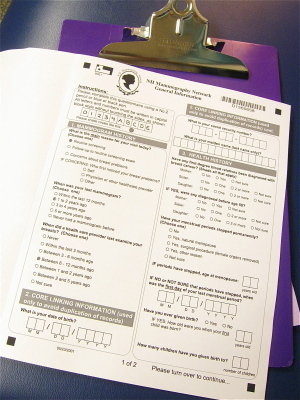 You may be asked to fill out a survey; it's something to pass the time while you wait, and hopefully it'll improve the service (or future health) of other women in your area. 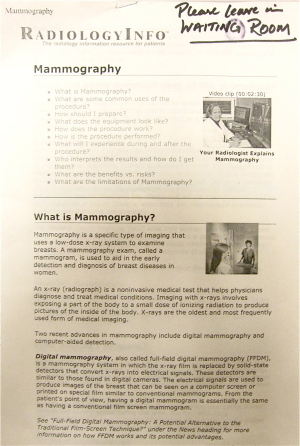 You may also find some explanatory materials regarding mammograms. Read them if you're interested. 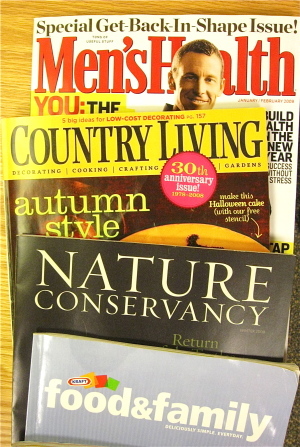 Or, check out the magazines. Not a bad selection... Although Men's Health in a mammogram waiting room? Again, consider bringing your own reading materials. 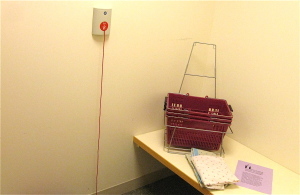 Finally, you'll be ushered into a small room that may include nothing beyond the mammogram machine, a computer, a chair, and perhaps a hook for you to hang your robe. Oh, and the radiology tech who'll be administering your mammogram. Here's Jennifer; she was nice enough to agree to being a part of my photography project. Remember "the big squeeze?" Here Jennifer is adding a recent improvement, the MammoPad. It's a VERY cushy pad, kind of like those thermopedic Swedish beds; it's ultra-soft, and conforms to your body. It definitely cushions the blow! ...then puts her hand where my breast will be, and shows how she can adjust the pressure in tiny degrees with a manual wheel. The clear plastic part is the top part of the sandwich; the MammoPad, the bottom. 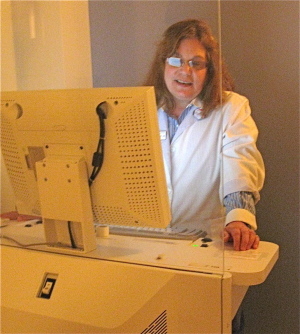 Jennifer has "loaded" me into the machine, and gone over to her computer, to press the button that'll deliver the X-ray. I took this photo just after the X-ray had been shot. No, I wasn't quite prepared to photograph myself actually getting a mammogram. That would have been an X-rated X-ray for sure! 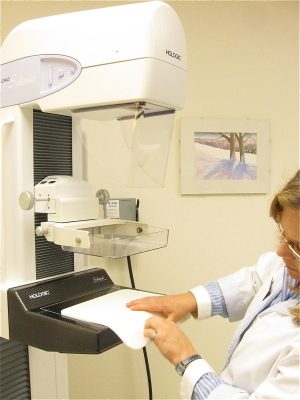 To get a mammogram, you step up close to the machine, close enough to place your breast between the two plates. You'll assume an awkward position, turning your head a certain way, and placing each arm in a certain place. The person administering the mammogram will position your breast between the two plates, then squeeze them together while urging you to stand as close as possible; this ensures that as much of your breast as possible is between the plates. Once she's satisfied with your position, she'll step back to the computer, tell you to hold your breath, and push a button to take the X-ray. 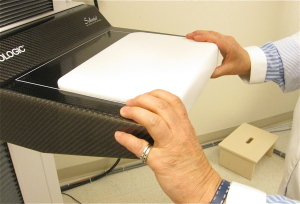 The actual X-ray takes only a few seconds, but your breast will be compressed maybe, oh, 15 to 20 seconds or so. I've never felt much pain from this; some women do. If you're pre-menopausal, it helps to schedule your mammogram for a time during your cycle when you know your breasts won't be tender. And/or take ibuprofen an hour or so before the mammogram. Both help. You'll have two views taken of each breast: one using a vertical squash, one horizontal. Those two views will then be married together via computer magic to give a 3D view of your breast (if you've had a digital rather than film mammogram; most facilities have switched to digital). 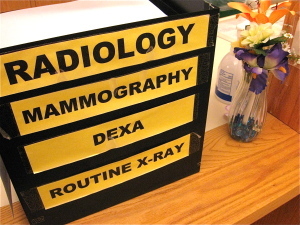 The person who gives you your mammogram most likely won't read it; that's left to the radiologist. So don't expect to hear any results right away. Once you've had both breasts done, you'll be on your way. The whole thing takes maybe 10 minutes; 5 minutes if you only need one breast done, like me. 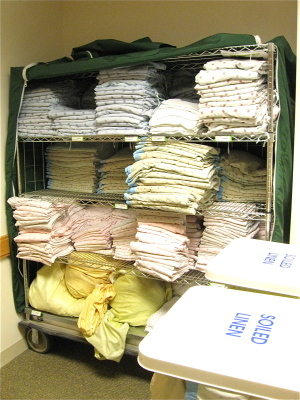 Back to the changing area, and its stacks of robes and johnnies, ready for the next fashion show. A week or so later: The Letter. Which hopefully says "Congratulations, everything's fine, see you next year." 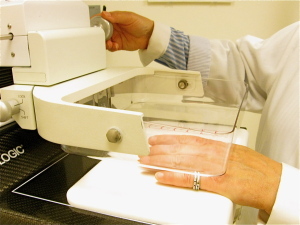 -Schedule your mammogram during a time of the month when your breasts won't be tender. -Take ibuprofen or your favorite analgesic about an hour before, if you're worried about pain. -Wear something simple. -Travel light. -BYOB (bring your own book).